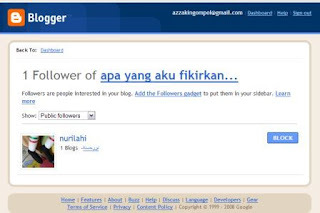 apa yang aku fikirkan...: Blogger is Now even Cooler! This is a new feature in Blogger in which you can subscribe to publicly become a follower of a blog, and others would also be your follower. If usually we only put links to other bloggers’ blogs in ours, in this new feature, you can see the updates in the subscribed blogs in your Dashboard once you log in into your Blogger account. Now you don’t have to patiently click one by one on the links just to check whether they have put new entries in their blogs or not. The Dashboard tells everything! Not only that, you can secretly be a loyal reader for a blog. This is most likely when you don’t want the author to know that you’ve subscribed to his/her blog. Isn’t it cool? Besides that, you can put a gadget from which you can see all updates from the blogs that you've subscribed. For example, see the middle bar in this blog under the section named "I Read Theirs". Thing like that... Again, clicking will be lesser from now on! To know more about this new feature, read here. So, my plan in making use of this new feature is to subscribe to all blogs that have been active since last few months to this blog; be it in giving comments or saying hello in the chatbox. I hope you’ll do the same to my blog also. It’s like building a network connection to all blogs you’ve linked in yours. Apart from that, this is basically the thing that I would like to implement in the IIUM Bloggers’ Blog, but since it uses WordPress, which is far complex than Blogger, so I couldn’t manage to do it. Maybe I should consider to transfer the community blog to Blogger instead of WordPress. Is it possible people? Note: I couldn't subscribe to some blogs for some reasons like error and undetectable feed. To those involved, please check your settings ok? mentang2 as public kan as jadi ur follower, glamour kan as kat sini lak eh. Erm, ekceli, when i viewed ur blog and read this entry barulah as tau benda tuh baru lagi. haha. Ingatkan da lama, tapi as je yang tak pasan. pasal aku kan sejak 2-3 minggu ni update setiap hari, cuma baru hari ni that i see this thing, so tu yang agak excited dengan mende baru nih. it'd very useful i think. baik! yey.. tak terhad setakat blogger je la eh? yup, I did subscribe creamstudents and etc2 yang bukan blogger. Men try and error jek, tak sangka leh apply jugak. The Following feature will be rolled out to all over the next few weeks, so if you don’t see it right away, don’t worry. It’s coming soon. This is why your having the problem subscribing kut. Same with me. But I'm currently in the process of a major makeover to my blog. Not just a new layout, but one major new feature as well in addition to this new blogroll that blogger just introduced. So don't expect to see any changes yet, I'll only make the changes once everything is in place, insyaAllah. mlm tadi bila akak check dashboard,ada sorang follower tu..
i didnt get the same message. the ones i got told about the error and problem with the feed, unlike what you wrote above. anyway, thanks. benda ni baru maybe tak nampak lagi ape significant nye. 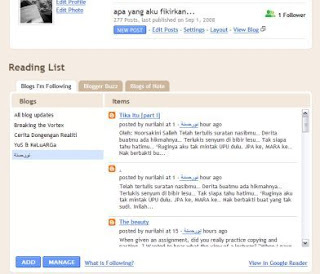 i rase wordpress daa lame kowt provide feature 2..
please dontlaa move iium bloggers to blogger..
but i have a good news. sekang adlan sedang menyiapkan something utk IIUMbloggers.com. he's more expert in WP i suppose. I'm just thinking that this follower is like a myBlogLog version for Blogger. Aiyah.. I'm not so expert in WP. just doing tweaking here and there. insyaAllah if you've 'free' time, you can learn on your own too..
can't wait to see the new layout in the community blog. yey!